We have created a forest of over 300 Christmas trees on the way to the Christ of the Ozarks! ​Experience Christmas from Thanksgiving night through January 1 (Thursdays, Fridays, Saturdays, and Sundays) with a by donation Drive-through light display with lights on from dark through 8:00pm. Let's celebrate the Light of the World! During the day, you can experience the Holy Land, Museums, and Backstage Tour! Advanced reservations required. Purchase those tickets now! Are you planning to come to Eureka Springs at Christmas Time? If you have any Christmas lights or artificial trees that you would like to donate to the Play, we would greatly appreciate it. Our physical mailing address is 935 Passion Play Road, Eureka Springs, AR 72632. 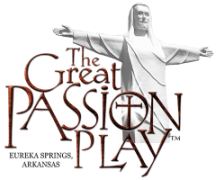 Give someone you love a gift certificate to the Great Passion Play. 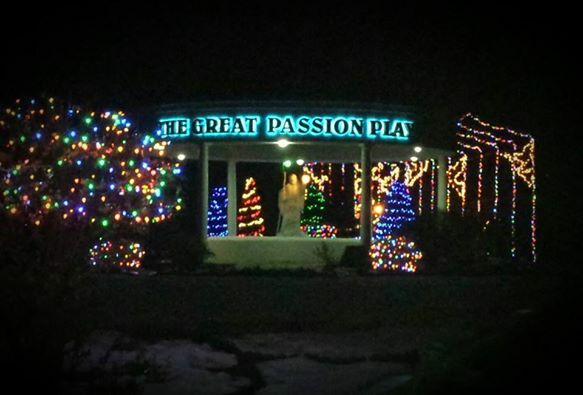 We will mail the gift certificate to you for admission for 2 adults to The Great Passion Play.